If asked as a child what he wanted to do for a living, 30-year Carmel Middle School teacher Pat Stadille may have replied with answers like horror movie actor, professional baseball player and Lego master. Never would he have imagined himself as a teacher, especially one who has gone on to become a keystone of his surrounding community, one whom students simply call “Stadille” out of familiarity, since “Mr.” is too staid a title to be attached to a man of his personality. There’s probably no teacher more well known by CMS students than Stadille, who teaches sixth grade science, ecoliteracy, nature studies and drama classes. But even if a student were to somehow evade him in the classroom for three years, there’s no avoiding the weekly school-wide gatherings, created and hosted by Stadille, every Thursday in the gym. “I got interested in the sense of community and meeting together as a group,” Stadille explains about how the gatherings got started. But this is a small contribution in light of everything he has done for the school. He has started many lunchtime communal activities, such as a softball league and ukulele club, and he even created a Wiffle ball stadium, completely from materials he got at garage sales—he doesn’t call himself “president of the Scroungers’ Hall of Fame” for nothing. Some of the greatest fun the nature-fanatic and his students have had has been on the various trips he leads: a smattering of birding field trips, weekend camping outings and annual adventures to the desert and Lava Beds National Monuments, of which the former was discontinued but the latter remains a hallmark of every CMS student’s eighth grade year. But perhaps Stadille has left the greatest mark on the school physically with his ongoing campaign to litter the campus with native plants, an effort that led him to be an integral part of creating the CMS habitat. 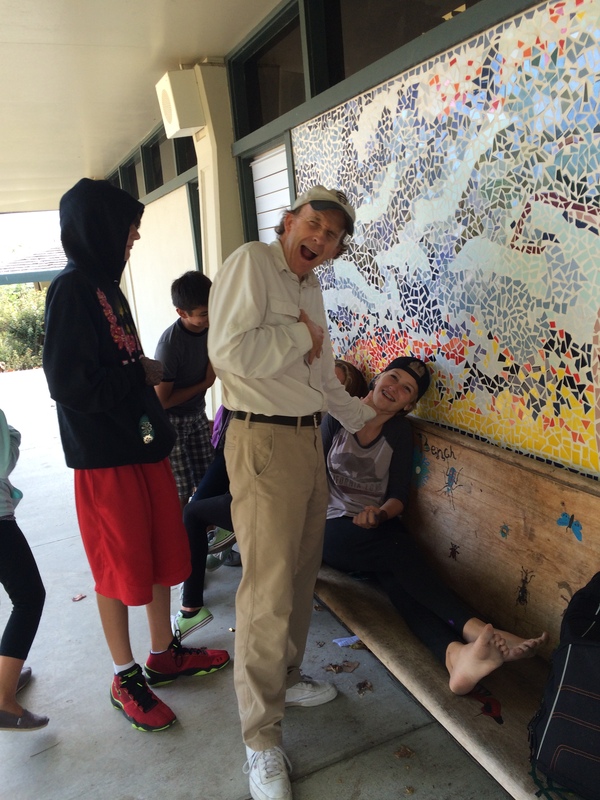 “He was very instrumental in helping me get the habitat pushed through at the Middle School,” says Carmel Unified school board member and former CMS principal Karl Pallastrini. In his spare time, Stadille is also a teacher, known for his nontraditional approach to teaching science. A day in his sixth grade Earth Science class might consist of planting native flora in the habitat’s bee garden, sketching organisms from the habitat’s pond, painting insects on school benches or even learning the scientific method from Stadille under the guise of Albert Einstein. “His theatrical skills played a large roll in his teaching methods and added greatly to his skill as a great teacher,” Hohenberger comments. It was only when he got to University of California, Berkeley, after two years at Hartnell College did Stadille decide to cast aside his childhood obsessions with drama, baseball and Legos aside in favor of his lifelong love of nature, and in junior year to apply his zoology major to teaching. However, even in this new profession he still attends to his old hobbies: He teaches CMS drama and acts as historical figures for his other classes; he plays Wiffle ball and softball with the students and mixes a little Giants indoctrination into his lessons; and he keeps a tub of Legos in his classroom. “Pat never conformed to the norms of teaching,” Hohenberger says. It is this very same nonconformist attitude that led Stadille to help save CMS from some hard times. According to Pallastrini, it was a group of young and exciting teachers he hired in 1985—“of which Stadille was the leader of the pack”—that brought up the school’s poor reputation and its student enrollment from 300 to 600 in only three years. Many of his previous students continue to be affected by Stadille’s presence in this way, including CHS senior Michael Montgomery, three years after bidding a bittersweet farewell to Stadille’s drama and nature studies classes. Stadille’s sense of caring also carries into his sense of family values, having officiated several weddings as an internet-certified minister and gotten married himself just last year. Through his philanthropic acts to improve CMS and his unique approach to teaching, Stadille has left an indelible mark on the school and all of its students. Stadille is to this day one of the most influential people of my childhood. No person I speak to, even to this day, does not hear about my amazing experiences with Stadille. My still strong love for the giants, my stories of going to the lava beds (yes I am old enough that I actually got to participate in that trip) and weekly events on the quad are all things I can only wish for my children. Thank you Stadille. Believing in me when most other cast me aside helped me become a better person. Going as far as having a special award at the honor roll ceremony for being the most helpful student made history in my life.